"product has changed my life"
"gave me back so much time"
"able to keep my inbox at zero"
One click filing. Save time and effort. 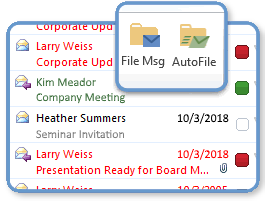 Whether your goal is Inbox Zero or just to save important emails, ClearContext makes it easy to file emails with one click. Your Inbox can also be streamlined by putting aside bulk emails automatically to deal with more efficiently later. Emails to actions. Stay on top of your interactions. 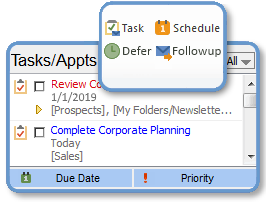 ClearContext is your email workflow assistant - reminding to follow up on an un-answered emails, turning emails into tasks or appointments, or snoozing messages out of your Inbox and back up top later. Project organization. Keep work together. Know what's next and coming up, and easily find what you need. 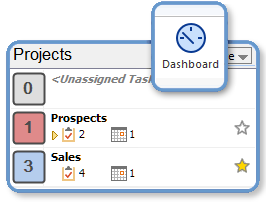 Project based organization gives you a view of the status, to-dos and related items that belong together - including contacts and attached files.